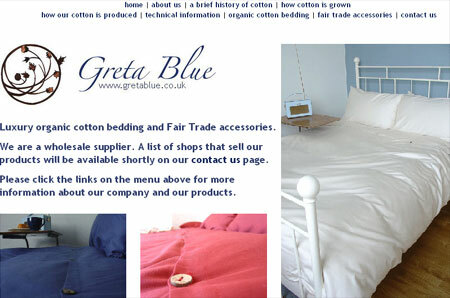 One of the things I have been working on over the summer is building and hosting a website for a new company from East London importing Indian made fair trade bedding. They are called Greta Blue. As well as a range of organic cotton bedding, they are also importing a set of fair trade toys and accessories, which are really cute. I didn't realise until working with them that the chemicals used in the production of non-organic cotton were one of the most significant causes of environmental damage in the areas where cotton is cultivated. Greta Blue are primarily a wholesale company, and they will be presenting their range at the Design Interiors 2007 show at the NEC in Birmingham in January. In the meantime if you want to find out where to get hold of their range you'll need to contact them directly. By Martin Belam on 23 October 2006.